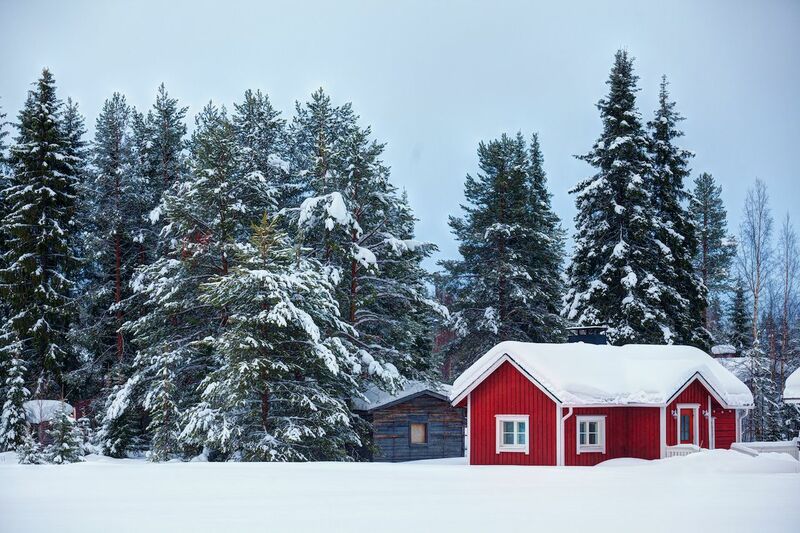 Home to Santa Claus, Finland’s a winter wonderland. When winter hits northern Finland, the sun makes itself scarce. It can stay below the horizon for two months… or longer. You might wonder why anyone would go there at that time of year. In fact, Finland is a magical place in the darker months, where blankets of snow stretch as far as you can see, purple and orange sunrise hues last for hours, and lit candles decorate every window. Add classic activities like reindeer sleigh rides, skiing, and hanging with Santa Claus, and Finland is the ultimate destination for a winter holiday. If you’re a sucker for all things cozy, here’s why you need to go to Finland this winter. Ok, most of the day is actually dark. If you’re above the Arctic Circle in the northern third of the country, the late December sky will be pitch black and star-studded by 2:45 PM. You could call it night. But while the sun doesn’t crest the horizon all day, every waking hour isn’t spent in darkness. Around 9:00 AM, you’ll notice an ethereal lavender hue in the sky. That color will linger for hours since the sun isn’t actually rising — rather, it’s hanging out just below the horizon. The light that does fill the sky reflects off the white snow and illuminates everything with a pale, crystalline glow. Nevermind that the North Pole is 1,600 miles away. 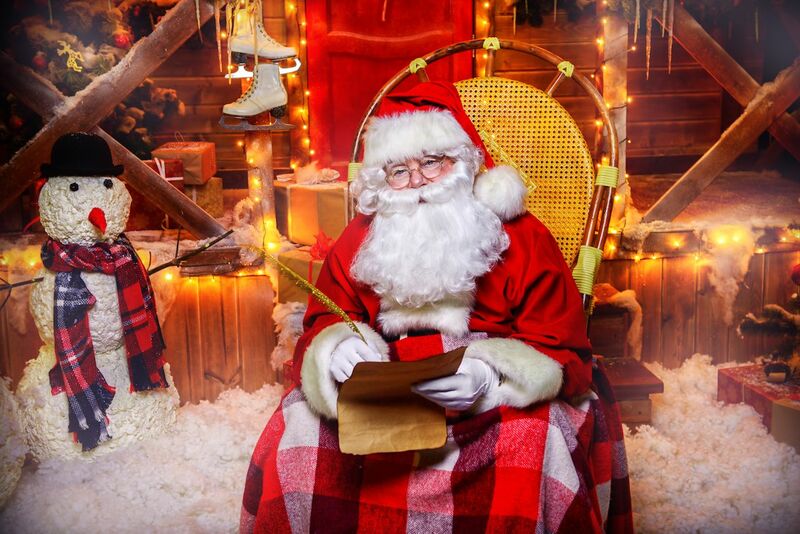 Rovaniemi is the official hometown of Santa Claus. It was declared that in 1985 back when Santa wore an earth-toned outfit and had mostly Finnish visitors. After Finland began marketing Santa’s Village more heavily a decade later, and put Santa in a red suit, visitors started arriving by the jumbo-jet load. Although Rovaniemi’s airport is tiny, the runway is long enough to handle big planes from places like the UK and China. EasyJet offers £49 fares from London into Rovaniemi in the days before Christmas, so kids can ask Santa for their gift and make it back home to England in time for bed. Half a million tourists now visit Rovaniemi yearly. 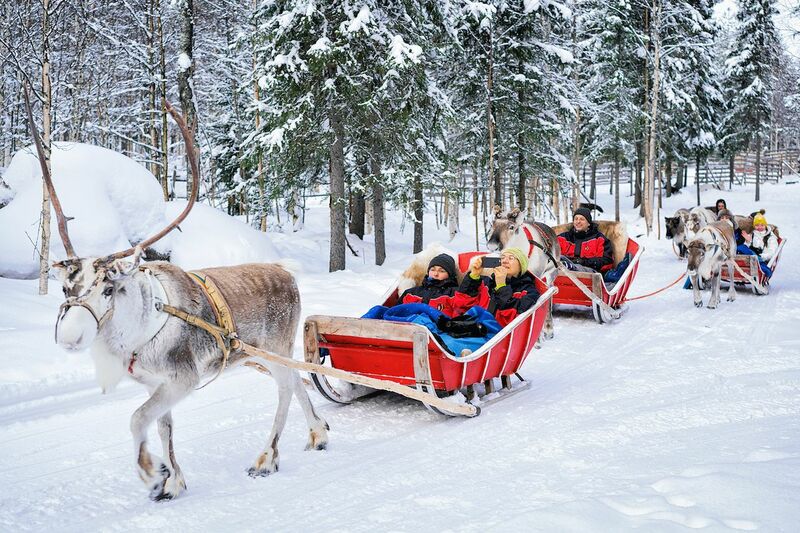 After meeting Old Saint Nick in the Santa Claus Holiday Village, you can do traditional Nordic things like ride a sleigh pulled by reindeer or go to a reindeer farm set amidst the birch trees and see the iconic animals cared for by folks in traditional, colorful Lapland outfits. Less traditionally Finnish options that are still apt for cold weather include going on sleds pulled by huskies or taking a snowmobile tour. You can book all these through the Santa’s Village website. If Santa’s Village is not your thing, Rovaniemi — which is a one-hour flight or a northbound overnight train from Helsinki — is still a super place for a winter break. In town in December, lit white candles decorate windows, lending it a romantic, moody quality. Just outside of town, the forests and the Ounasvaara, a gently sloped mountain that overlooks the town, are cloaked in snow. The Ounasvaara is a wooded resort area next to the Kemijoki River, a fast-moving river that somehow manages to freeze, along with everything else, in the height of winter. Alongside that river, on the lower slopes of the Ounasvaara, and even on top are multiple cabins that you can rent. 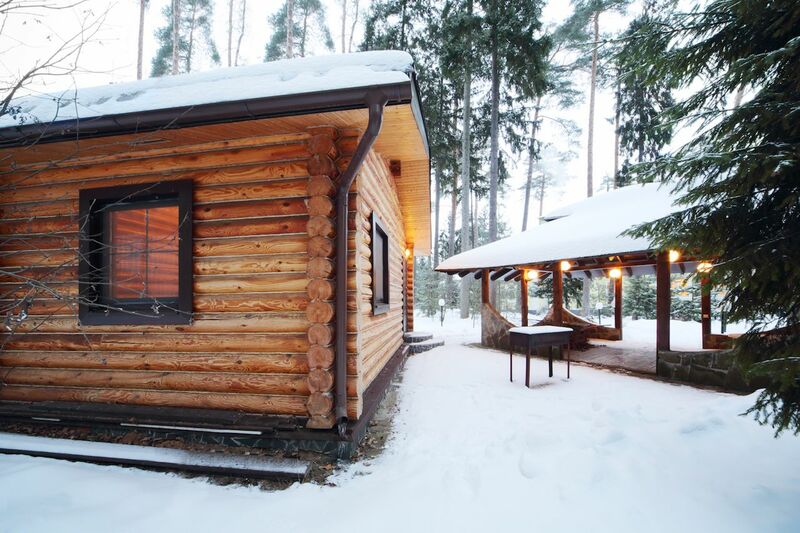 Decorated in crisp Nordic style with blond wood and unfussy furnishings, the two-story cabins all have saunas, which are a great place to warm up after a day outside. The top of the Ounasvaara is a big plateau with 120 miles of cross-country ski trails, which are well-maintained and lit. You can also snowboard, downhill ski, or even bobsled on the Ounasvaara. 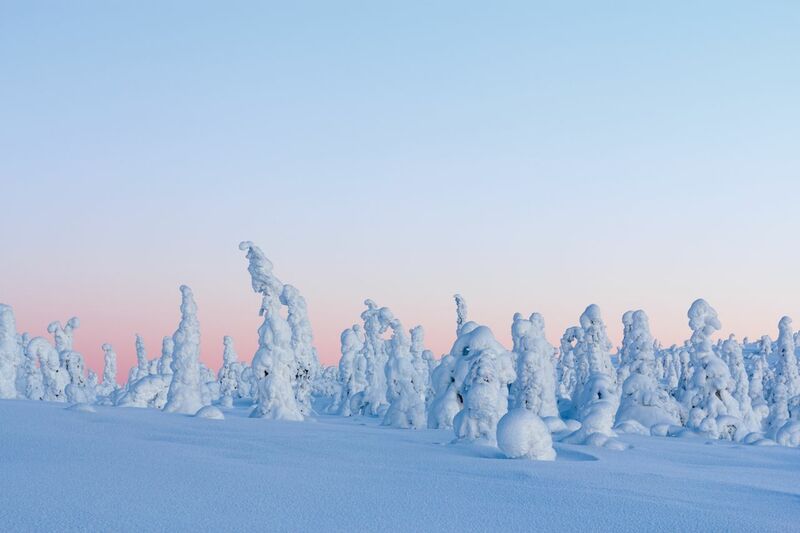 Finland doesn’t have very tall mountains — they’re more like fells, or very big hills — but it’s got powder snow to spare. 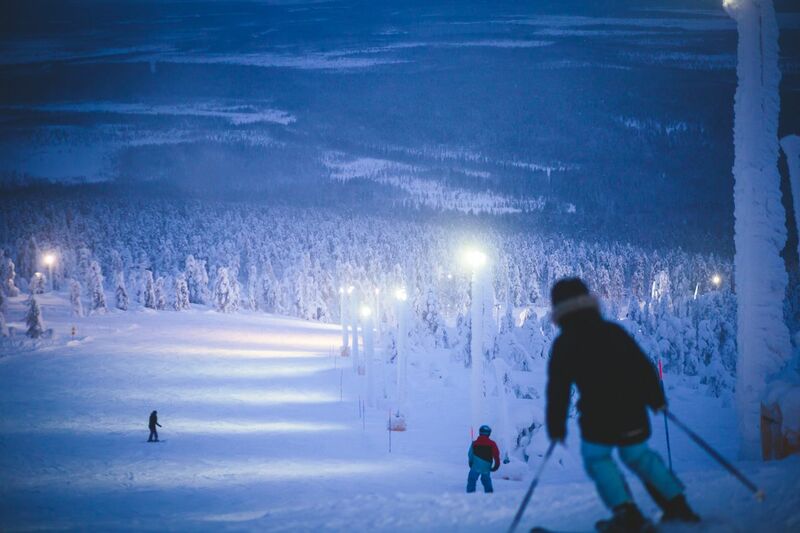 One hundred miles north of Rovaniemi is the ski resort Levi, which has tall enough pistes to host World Cup championships. Snow falls on the trees and then stays frozen there until the spring thaw, so literally everything is white. The landscape is whiteness – white ground, white hills, white outlines of trees — against a pink, purple, deep blue, and then black sky. In Levi, the chairlift takes you to the top of the resort, which is 1,742 feet above sea level. In the middle of the day, that’s just high enough to look to the horizon and see the edge of the sun, which at ground level would be fully below the horizon. The blazing colors of sunset, or maybe it’s more like sunrise, stretch out along the horizon for a couple of hours. By mid-afternoon, you’re skiing in full-on darkness, but the runs are well lit. It’s pretty rare to ski under a black sky but be able to see the piste below you. Since everything is so well lit, lifts stay open late. You could ski until 7:00 PM if you wanted to — as long as you wear more layers than you’ve ever worn before. Not far from Levi, at the Ylläs ski resort, in between skiing you can take a couple of hours to relax at the mountainside hot tub and actually get into a sauna on the chairlift, one of the craziest saunas in the world. Sauna is a Finnish word, and once you come to Finland, you’ll understand their obsession with them. Finnish saunas often have space below the glass door to let in fresh air, they generally are near a lovely view — though not usually of a ski slope underneath — and they’re always near someplace where you can cool off. In winter, since the rivers and lakes are rock solid, that cold place could be the snow — ready to be rolled in. But when it’s 20 below, stepping outside might be enough. Finns didn’t come up with this trick, but if you’re going to freeze your buns off in temperatures that can plunge well below -20 degrees Fahrenheit, you should have some fun with it. 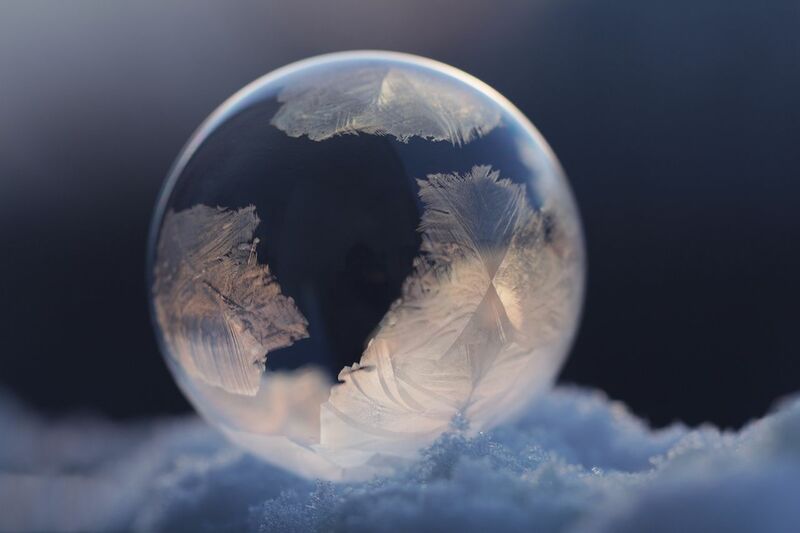 When you go to northern Finland in mid-winter, bring some soap bubbles with you. Wait for the coldest day in the forecast. They go outside and blow those soap bubbles. They’ll freeze before they hit the ground, or shatter in mid-air. 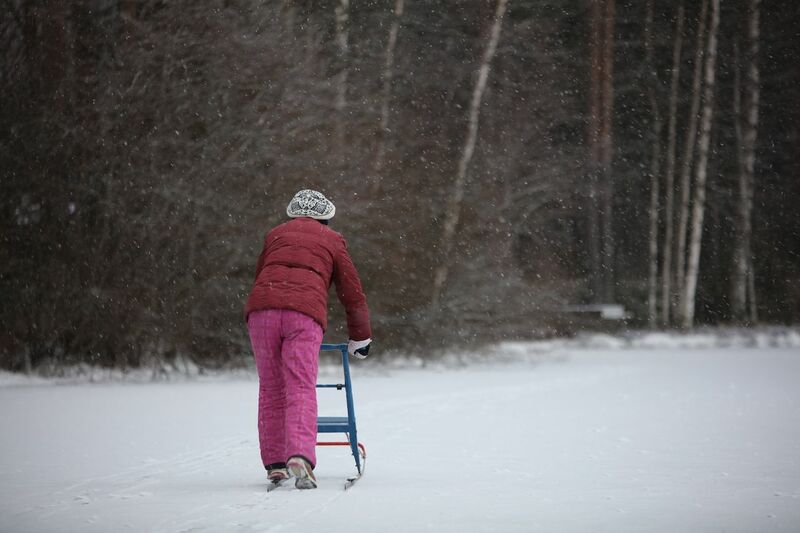 Throughout northern Finland, folks forgo snow chains and spinning tires for old-school transportation. The snow kick-sleds have two long skis with a basket or a chair on top. You put your foot on one ski while you propel yourself forward with the other foot, like a scooter. They’re easy to find in places like Levi. You can just pick one up and cruise around on paths throughout the forest, or head to the local grocer. After saunas, Finns cope with the bitter winter temperatures with hearty food and drink. 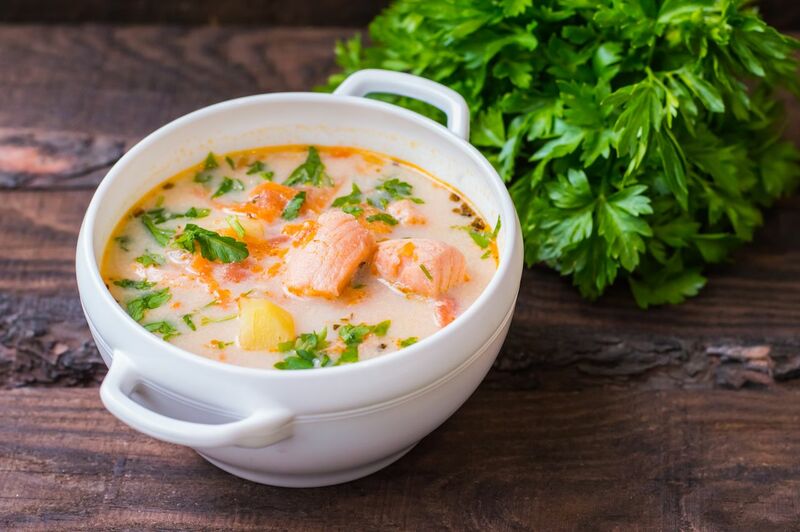 Right on the ski hill in Levi, there’s nothing like popping into a ski lodge and finding it glowing and warm inside, offering up a delicious salmon chowder, rich with chunks of salmon and potatoes, flavored with herbs, and served with a thick slab of rye bread. Other classic winter recipes are reindeer with mashed potatoes and beet soup. Karelian pies are a savory pastry made with rice and rye flour, and pulla look like cinnamon rolls but are spiced with cardamom and a touch of sugar. You can also warm up with a shot of salmiakkikosu, which is vodka made with salmiakki, the weirdly salty and strong licorice Finns are so addicted to they add it to vodka. As for vodka, Finns love it so much they give it to Santa Claus (or a relative in a Santa suit) when he comes to drop off presents on Christmas Eve. By the end of the night in town, drunk Santas teeter along the city streets. Drink too much salmiakkikosu and that could be you. 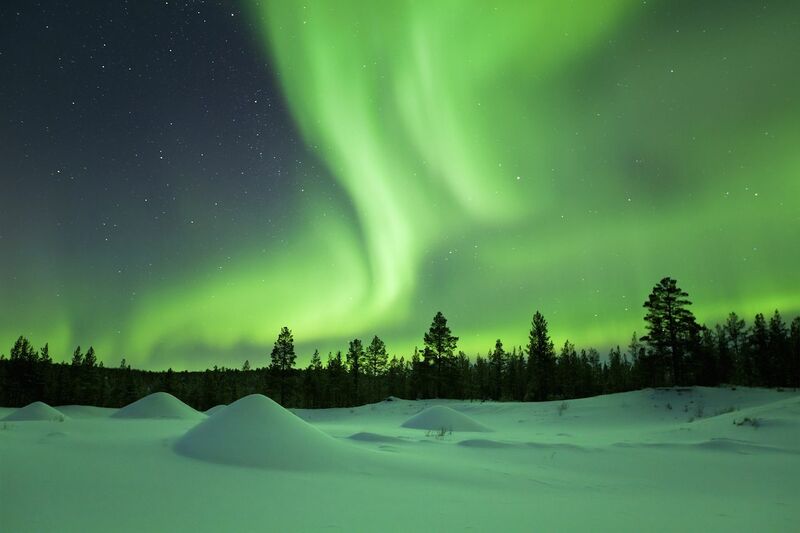 The northern lights are never a guarantee, but above the Arctic Circle, you’ve got great odds for spotting the unusual bands of lights that streak across the sky, sometimes green or purple-hued, moving like ribbons dancing to their own rhythm. We’ve all seen the movement of waves or flags swaying in the breeze. But these charged particles near the earth’s poles move in patterns you’ve never seen before… and won’t soon forget.